Claude Julien lost his job as coach of the Boston Bruins on Tuesday. GM Don Sweeney announced the news at 8 a.m. in a written statement, and then followed that with a press conference a few hours later. Whether or not they agreed with the decision to dump the coach, many Boston fans and commentators found the whole business distasteful if not outright insulting to the city and all it stands for: the New England Patriots, after all, were parading in Boston that very day to celebrate Sunday’s Super Bowl victory. Sweeney, as you would, looked like he’d rather be anywhere else, in any historical period. He apologized for the poor timing, tried to explain. He wanted to give the new, interim coach — 51-year-old Bruce Cassidy, who’d been aiding Julien as an assistant — hoped to give him a chance to practice with the players before they had to play a game. Julien, who’s 56, started in Boston in 2007. That made him (up to the minute of his dismissal) the longest serving of NHL coaches. He departed the Boston bench as one of game’s most respected benchers, having steered the club to a Stanley Cup championship in 2011, the first for the Bruins since 1972. No coach has won more Cups than that in the team’s 93-year-history. Julien also coached the team through more games than anyone else, including the legendary Art Ross, while chalking up the most wins. Graded by winning percentage (regular season + playoffs), his .555 falls back of Tom Johnson (.670) and Cooney Weiland (.602). Cassidy has two wins, so far, to his name, and a perfect percentage: the Bruins followed up Thursday’s 6-3 victory over San Jose with a 4-3 decision this afternoon versus Vancouver. While he relishes those, maybe what we’d better do is review the hirings and firings of Cassidy’s 27 forebears on the Bruins’ bench, starting back when the Bruins started, in 1924. Art Ross came first, of course, serving as Boston’s everything in those early years of the club, stocking the roster, forging an identity, and coaching the team through its first 461 games, which yielded one Stanley Cup (1929). After ten years at the helm, he was looking to focus his energy. He was 49 and he’d been ill with intestinal trouble. Candidates were said to include Lionel Hitchman, Eddie Powers, Cecil Hart, and Tommy Gorman — maybe Nels Stewart? In the end Ross hired Frank Patrick, also 49, a good friend who’d been working as the NHL’s managing director. The Bruins did win under Patrick, though they didn’t manage a championship in the two seasons he was in charge. Eric Zweig’s 2015 biography Art Ross: The Hockey Legend Who Built The Bruins is a good guide to Patrick’s exit in 1936. Ross thought that Patrick was too friendly with players and referees, plus he was drinking too much, and the two men had stopped talking. 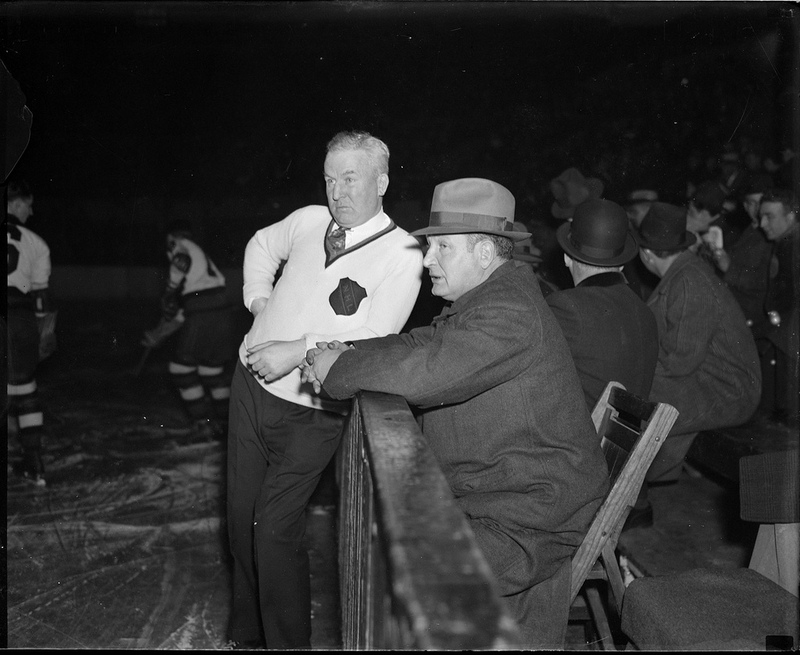 Patrick wasn’t fired, exactly: he just wasn’t, in newspaper parlance from the time, “re-engaged.” Former Bruins’ captain Lionel Hitchman was coaching the team’s minor-league affiliate, the Boston Cubs, and he was once again mentioned as a possible successor. 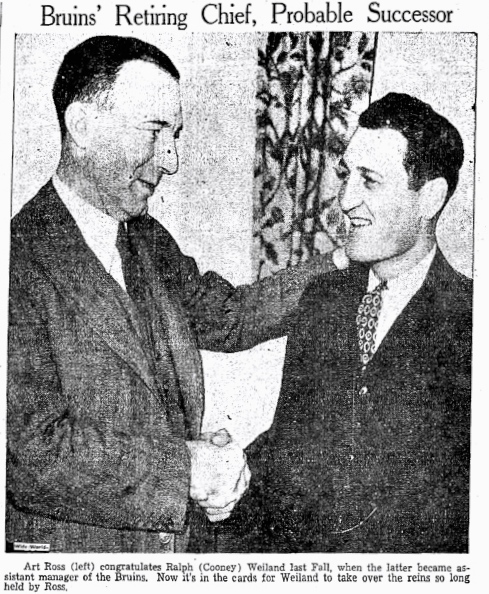 Asked whether star defenceman Eddie Shore might take on coaching the team from the blueline, Ross was non-committal. So Ross returned. He stayed on through to 1939, when he decided for a second time that he’d had enough. He ceded the coaching to Cooney Weiland, the newly retired erstwhile captain of the Bruins who’d spent the last year of his NHL career as Ross’ playing assistant. Under Weiland, the Bruins prospered, and in his second year, 1940-41, they won a Stanley Cup — whereupon the coach left the champions to take over the AHL Hershey Bears. Eric Zweig suggests another feud. 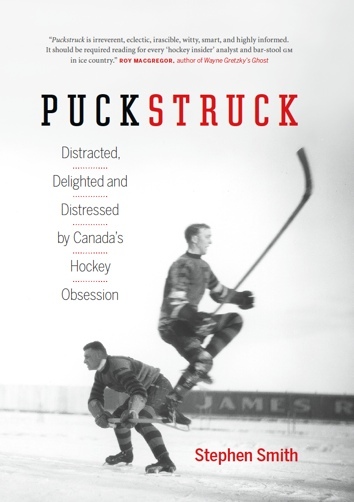 In a chapter of his book in which he looks into Ross’ fallings-out with Eddie Shore, Bill Cowley, and Herb Cain (not to mention his blood-grudge with Conn Smythe), he concludes that Ross wouldn’t, couldn’t — didn’t — let his coach coach. Again Ross was ready to get back to doing it for himself. He stayed on this time through 1945. “I’m through,” he declared that spring. “I’ll never sit on the bench again.” Another of his faithful captains had been acting as a playing assistant, 38-year-old Dit Clapper, who was now ready to retire. Or maybe be retired. “We want Dit to quit before he is seriously hurt,” Ross said. Clapper himself wasn’t entirely sure he was through as a player. Not long before hewas appointed, he’d been telling Harold Kaese of The Boston Globe that he’d “hate to do nothing but sit on the bench.” And, true enough, he did continue to play for the first couple of years he coached, if mainly on spot duty, replacing injured players in the line-up. Clapper, who was 42, was headed for home. His wife hadn’t been well, and he had a teenaged son and daughter, along with (as Ross, once, had had, in Montreal) a thriving sporting goods store. “My family and my business in Peterborough, Ontario, now demand all my attention,” he told the room. Art Ross was overcome with emotion. As for the players, they had a gift to give: a hunting rifle. I don’t suppose anyone would have batted an eye if Art Ross, now 64, had returned one more time to the Boston bench. He didn’t, though. Art Ross had his side of the story to tell. He was up in Canada, acting as league supervisor for the Stanley Cup playoffs, but made a special trip home to Boston to clarify things for reporters. “We haven’t lied to you people in 26 years,” he told them at a press conference where he sat alongside team president Weston Adams and a director named Frank Ryan. Suburban Boston would work, too. “This is the kind of an opportunity I’ve been hoping and searching for,” Patrick said. “I’m ambitious to get ahead in hockey and don’t want to be a coach all my life.” And so a succession plan was in place: after two years of coaching, Patrick would ascend to replace a retiring Ross as general manager. That didn’t go quite as planned. Ross kept going through the spring of 1954, announcing his retirement, in the Bruin way, at the team’s annual end-of-year banquet. Under the new plan, Patrick would take on the role of general manager while continuing to coach for one more year. 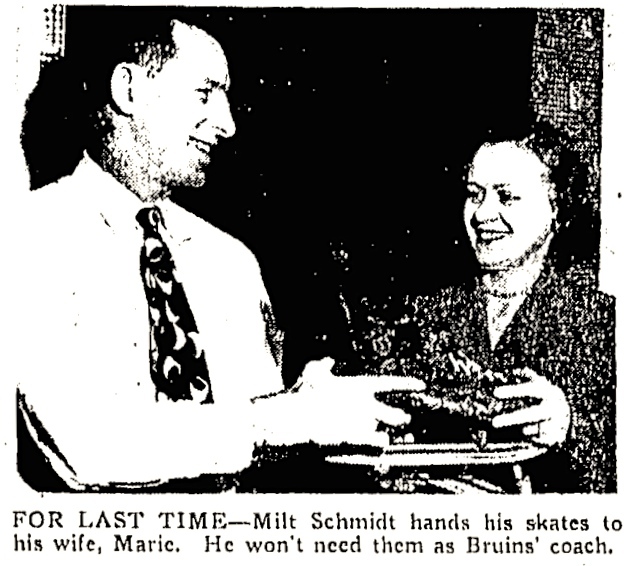 By then, captain Milt Schmidt would be ready to retire and, in the Bruin way, turn himself into the coach. 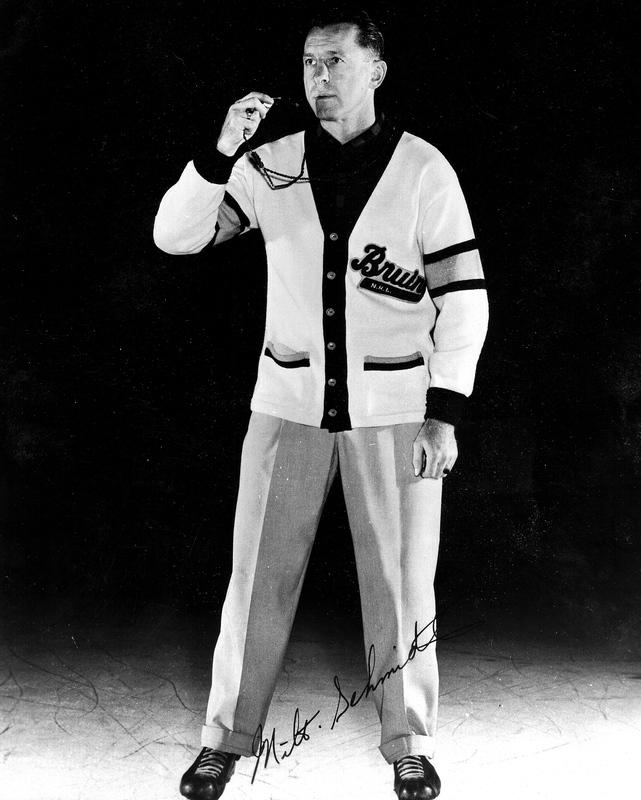 Bench Bruin: Coach Milt Schmidt, as he was when he finally hung up his playing gear, guided Boston through 11 seasons, from 1954 through to 1966. He later steered the Washington Capitals, from 1974-76. That plan shifted, too. Schmidt, who was 36, started the 1954-55 season on the ice, a knee injury soon forced him to the sidelines. He was in the line-up and out and then, come December, Patrick suggested he take over the bench for a game in Toronto. “You’ll be handy so you can help me, won’t you?” Schmidt wondered, according to a Harold Kaese account from The Boston Globe. “If you’re not, I’m not,” said Schmidt. The Leafs won that game 6-0. Schmidt persisted, and things worked out better the following night: he won his first game as a coach when the Bruins beat the Chicago Black Hawks 3-2. He played a few more games, missed a few. The dangers of the bench were apparent whether he was coaching or playing: out of the line-up for a game against the New York Rangers, he slammed a bench door on his hand while trying to get his lines changed. Dressed against Chicago, an errant puck knocked him unconscious while he was sitting with his linemates. Seven years Schmidt coached before the time came for him to take a job as Patrick’s assistant general manager. In came Phil Watson. I don’t know how much you know about the speedy former New York Ranger winger who was also a beloved Ranger coach in the 1950s. That as a player he’d sometimes burst into tears at critical moments on the ice? That, skilled as he was, other teams and their fans reviled him as much as anyone (possibly) has ever been reviled in all the league’s history? That the English language often came out of his mouth mangled as a mouthguard? That as Ranger coach he accused his own players of being “fat and complacent”? When he was hired in Boston in June, 1961, he announced a change in policy. If a player needed to be ticked off about his play no longer would he do it in public. The words ‘You stink’ would be banished from his lexicon. A teddy bear bearing the sign “Watson” was suspended from the balcony during the game and was interpreted as a suggestion that the Bruins buy up the remaining year and a half of Watson’s three-year contract. A crowd of 10,041 hooted through much of the game and several of them hanged Coach Phil Watson in effigy — a monkey doll suspended by a rope from the first balcony with the label “Watson” on it. Schmidt’s second stint as coach lasted four years. Those were bad, bottom-of-the-NHL-barrel years, but he thought he might stick around for one more season, if only because Bobby Orr was on his way into the league. He decided not to, in the end, opting instead (as GM) to blood young Harry Sinden. Just 33, he’d never played in the NHL, but the Bruins had been grooming him as a coach and in 1966 they deemed him ready. They had a few more rough seasons before they started to rise. In 1970, of course, Sinden’s team won a Stanley Cup. Whereupon, in the Cooney Weiland way, he quit the team. In Sinden’s case, he had a very exciting opportunity waiting for him, as an executive with Stirling Homex Inc. of Avon, New York. Maybe it was hard for people to understand, but the job he’d be doing presented “exciting new challenges in mass residential construction,” Sinden said, and what really could anyone say to that because (as I’ve written before) if there’s one thing hockey doesn’t offer and never has, it’s mass residential excitement. Had Sinden been blackmailed, maybe knocked on the head? The truth did, eventually, get out: Sinden told Sports Illustrated that Schmidt had turned down his request for a raise of $8,000. “I’m flabbergasted,” is what Schmidt said before that. Hall-of-Fame former Habs and Bruins defenceman Tom Johnson, 42, took over. He steered the team to a Stanley Cup in 1972 — only to be shown the door a year later. “When you do something like this you naturally hope it can turn things around,” said Harry Sinden. “But you just don’t know how it will work out.” Schmidt had moved up to became the team’s executive director with (in the Lynn Patrick way) the man he’d hired to coach taking his place. It was February, then, just like now. A Monday morning. After he’d talked to Johnson, Sinden called in the coach of the Boston Braves, the Bruins’ AHL farm club. Bep Guidolin, 47, had played for the Bruins, starting way back in 1942-43, when Art Ross was still coaching. Guidolin was 16 then, the youngest player ever to have skated in the NHL. “What’s happening?” Guidolin said when he got to Sinden’s office. “It’s our team,” Guidolin said. Art Ross, Bep Guidolin, Bobby Orr, Boston, Bruce Cassidy, Cecil Hart, Claude Julien, Cooney Weiland, Dit Clapper, Don Sweeney, Eric Whitehead, Eric Zweig, Frank Patrick, George Boucher, Harry Sinden, Joe Primeau, Lester Patrick, Lionel Hitchman, Lynn Patrick, Mike Rodden, Milt Schmidt, Peterborough, Phil Watson, Tommy Gorman, Weston Adams, Weston Adams Jr.